Discontinued Model, No longer in production by DW. With half a century of manufacturing fine firearms, Dan Wesson is proud to mark this special occasion with the custom 50th Anniversary 1911 A2. This understated yet tasteful model features intricate scroll engravings throughout, roll mark delete and a high polish nitride finish reminiscent of a deep blue. 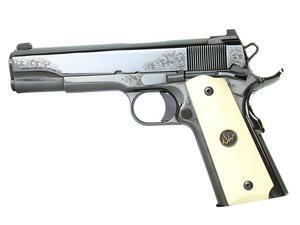 The G10 grips offer the look of ivory with inlaid DW logo medallions. The grip safety and recoil spring plug are engraved and gold inlaid with DW and 50th respectively.